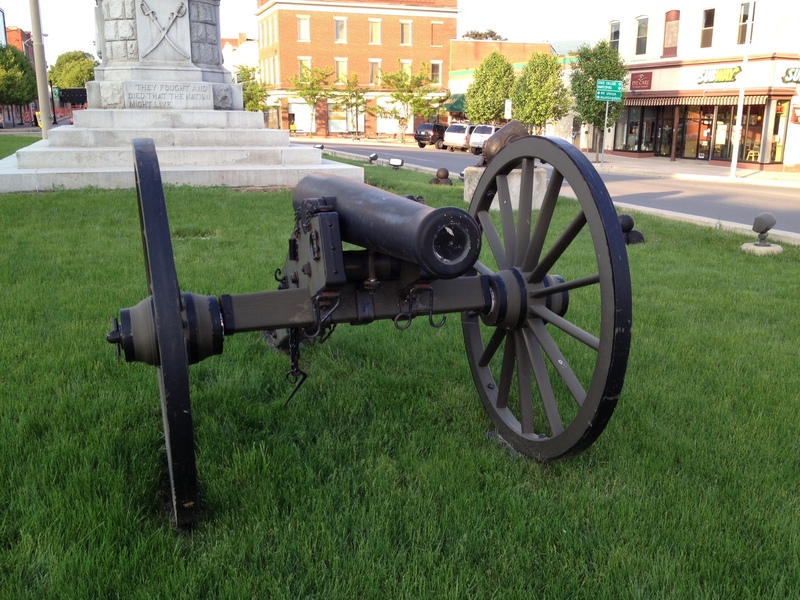 One of the things that I’ve become more interested in over the years is artillery – especially the artillery that was used during the Civil War. I started a series a few months ago to explain some of the basics of these weapons – it is best to see that article first to get familiar with the “anatomy” of the guns. 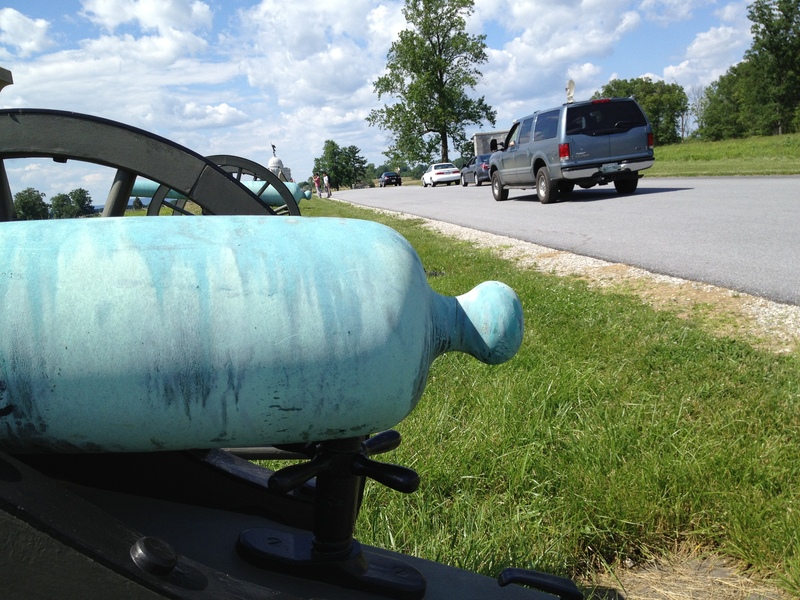 Today, I want to explain how to identify some of the different types of bronze cannons, using familiar examples from the collection at Gettysburg. 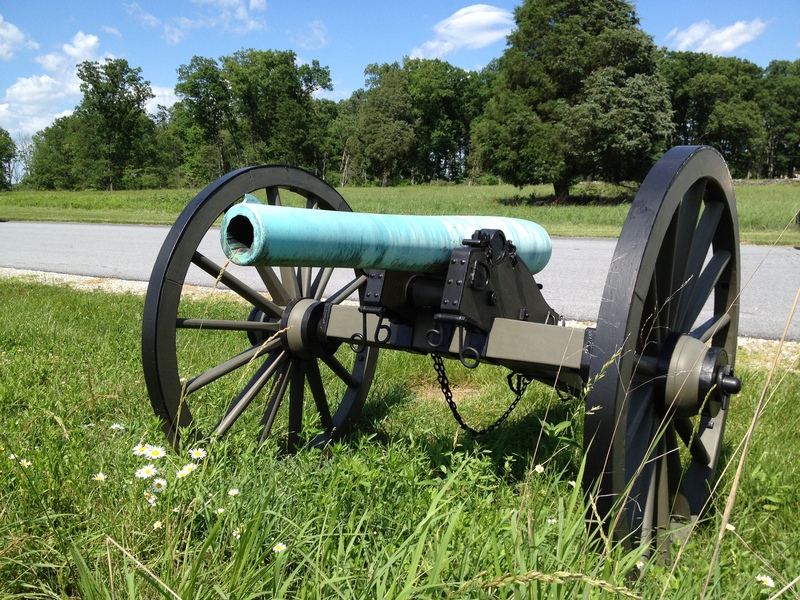 Overview: The most common type of bronze gun during the Civil War was the Model 1857 12-pounder Field Gun, commonly known as the “Napoleon” since this was an American copy of a French design that was popular with the famous general. There were 244 (though not all made from the US pattern) of these present at the Battle of Gettysburg. 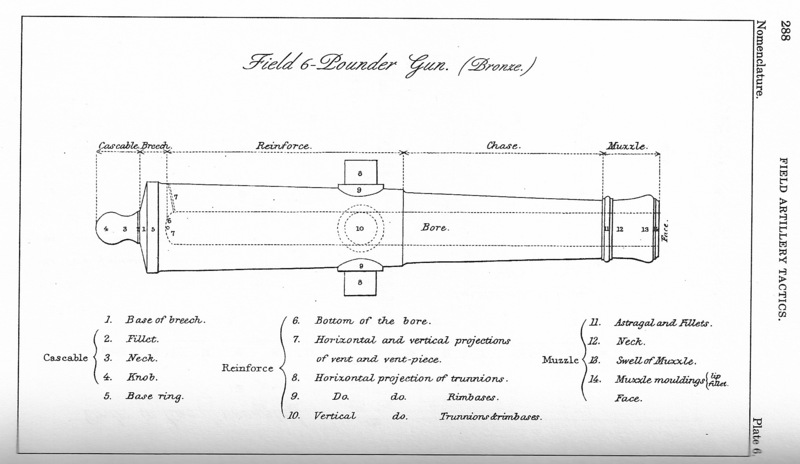 While still a seemingly old-fashioned smoothbore, these weapons represented an innovative design, and were officially referred to as Gun-Howitzers, as they could operate effectively firing at either low (like guns) or high (like howitzers) angles. 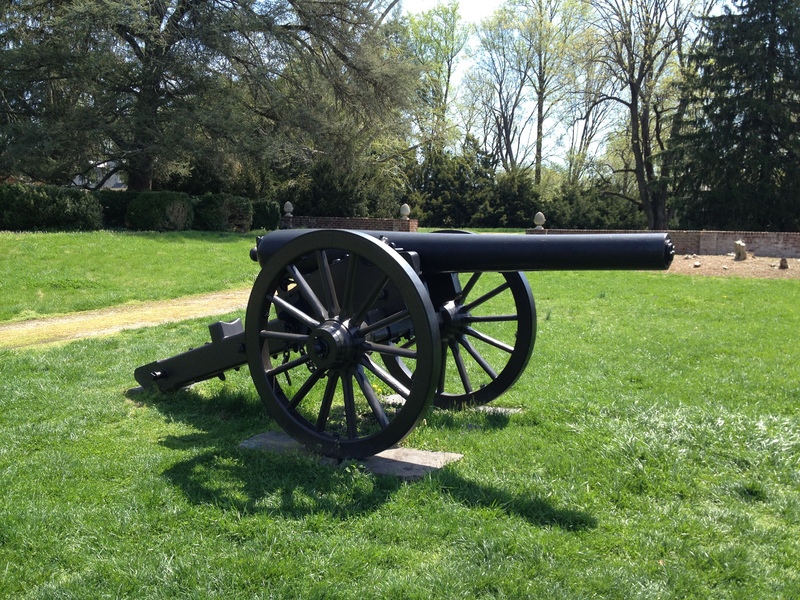 The “12-pounder” aspect of its name refers to the weight of the solid-shot projectile it would have fired. While a rifled weapon is more accurate at long range, the Napoleon’s large, smooth bore (4.62 inches in diameter) made it very well suited to fire canister rounds, making it absolutely deadly against troops at close range. 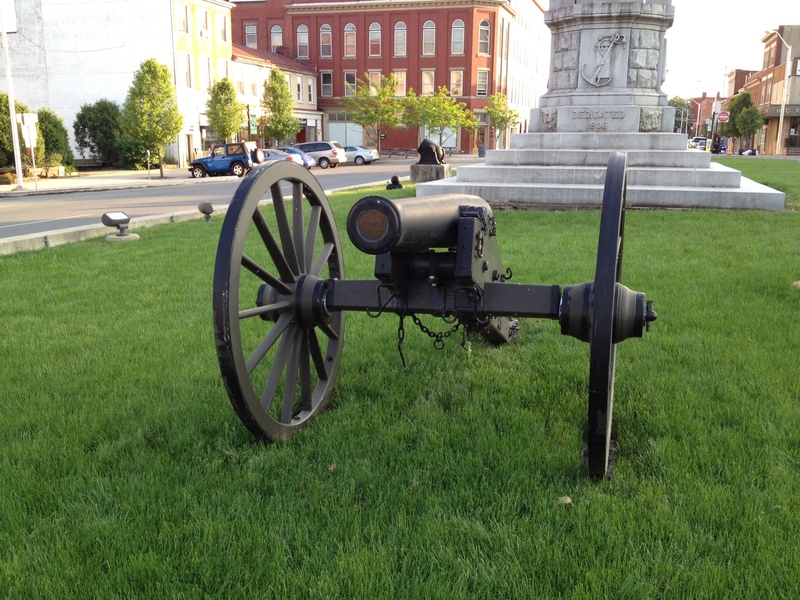 Front View of the Model 1857 12-pounder. Rear View of the Model 1857 12-pounder. How to Identify: The most obvious clue from a distance is the color, of course. Since the Napoleons are bronze, they will be greenish in color. The shape of the gun is smooth. There are no ornamental beads running around the tube like you see on the older 6-pounders. The tube is tapered from the breech down to the muzzle, which is flared out. 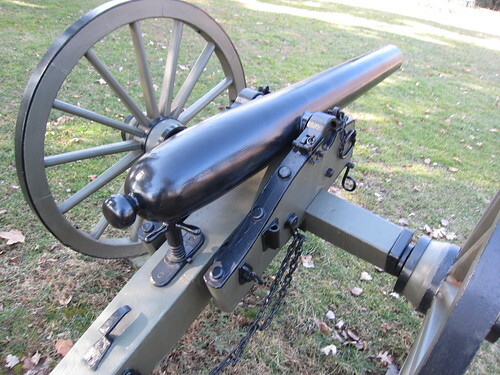 The breech of the gun is relatively flat on the back, with a flattened area on the bottom of the tube where the gun rests on the elevating screw. Napoleons generally have markings on the front of the muzzle, and a “US” acceptance mark on the top of the barrel between the trunnions. 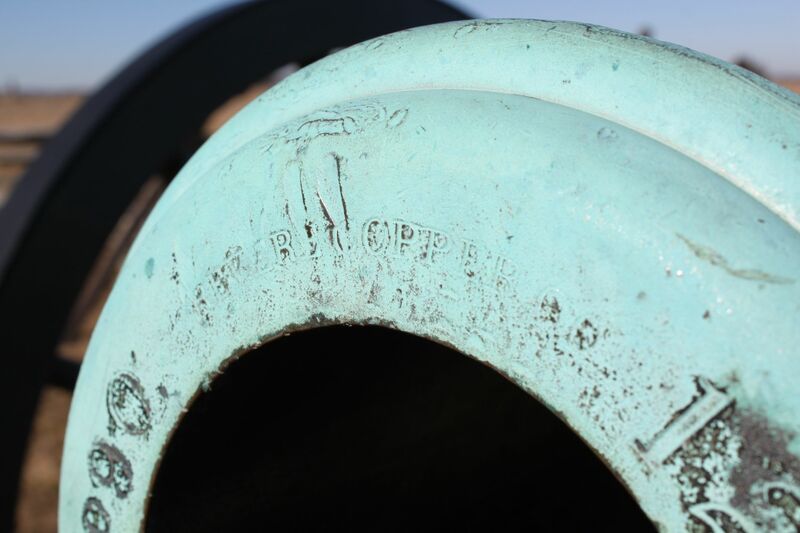 There may also be markings on the breech, and the ends of the trunnions, as well as a foundry serial number on one of the rimbases. Experimental Rifled Napoleon. Note the front sight at the top. Photo by John Dolan. 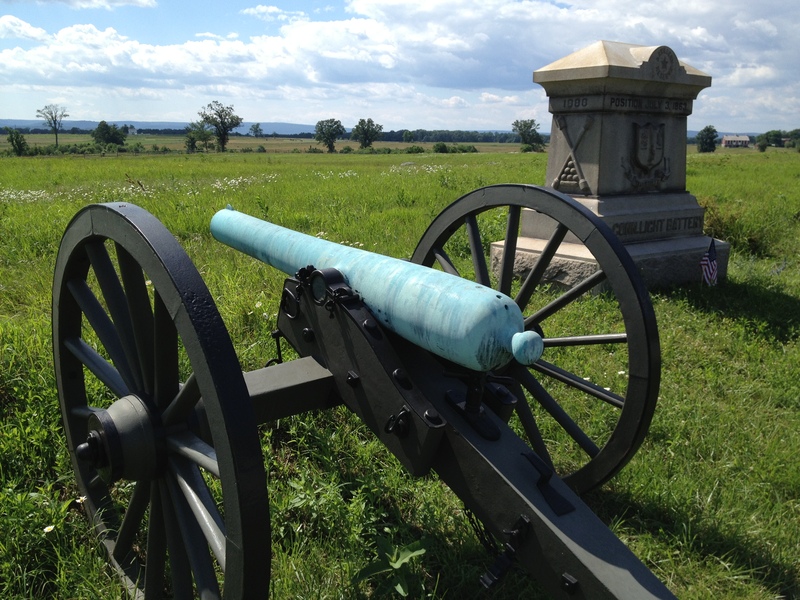 Fakes: There are a few – about 15 – “False Napoleons” at Gettysburg (and maybe on some other fields, too). Since Napoleons are in short supply, and they share a similar shape, these are actually Model 1841 6-pounders that were modified in the post-war years to look like Napoleons so that they could be placed in battlefield displays. If you look closely, you’ll see marks on the barrel near the muzzle where the astragal was removed, as well as in front of the trunnions where the lip has been smoothed down, and on the breech where the base ring was shaved-down. 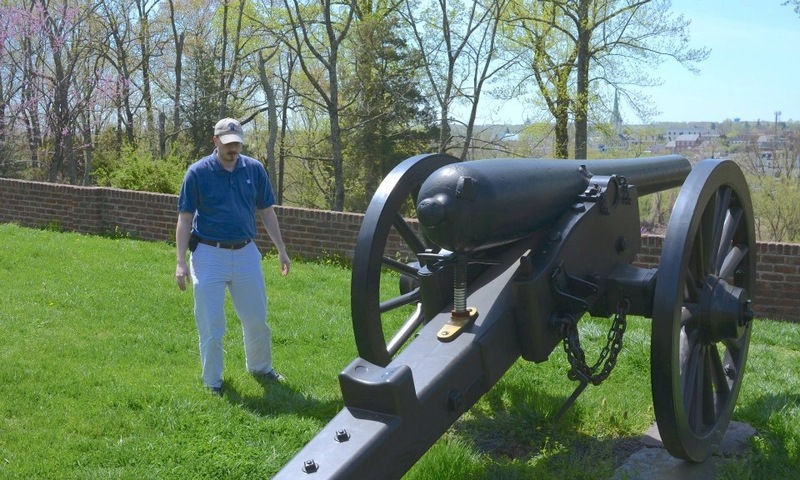 These guns have also had the first 6 inches or so of their bore increased in diameter to the 12-pound size – the rest remains the 6-pound gage – so that they look right from a distance. This is the easiest clue to know that you’re dealing with a “False Napoleon”. See the section below on the Model 1841 6-pounder to get an idea of what I’m talking about. 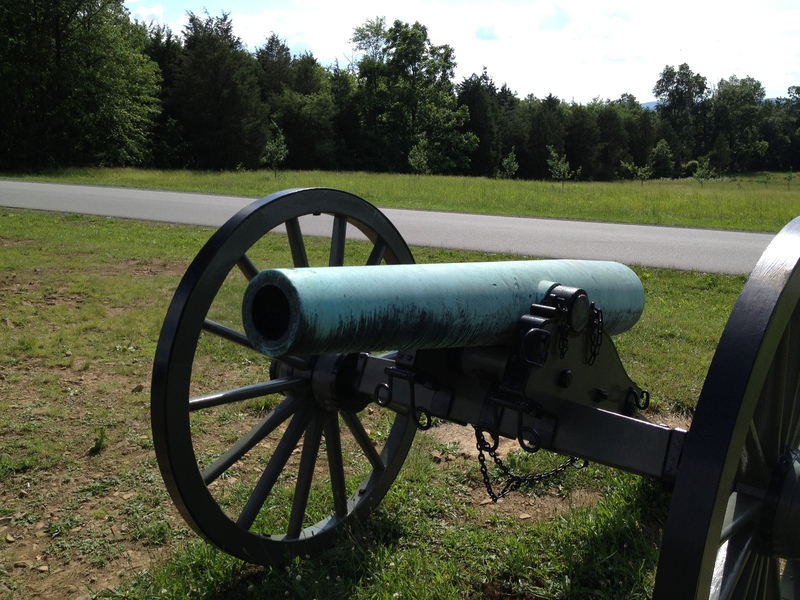 Overview: This is the Confederate copy of the smoothbore US Model 1857 12-pounder design. Because of a lack of resources (both in material and manufacturing capability) these are generally pretty stripped-down copies. There isn’t a muzzle flare on these, for example. Front View of the Confederate “Napoleon”. Rear View of the Confederate “Napoleon”. How to Identify: These are about the same size as a US Napoleon, but there is no flare at the muzzle – that’s the main visual difference. The tube still has a taper from the breech to the muzzle. Since the Confederacy had some difficulty acquiring a supply of copper (especially as the war went on) some of their guns have a dingy gray-ish appearance rather than the bright green you normally see on an old bronze gun. This was due to lead or other metals being mixed-in in place of copper in the bronze (though not in the example above, it appears). Like their US counterparts, these will have markings on the muzzle, breech, or trunnions. Exceptions: There is at least 1 Confederate Napoleon at Gettysburg that was manufactured by Quinby and Robinson. This particular gun has a very simple, flat astragal around the muzzle. There may be other slight variants. Fakes: None that I know of. 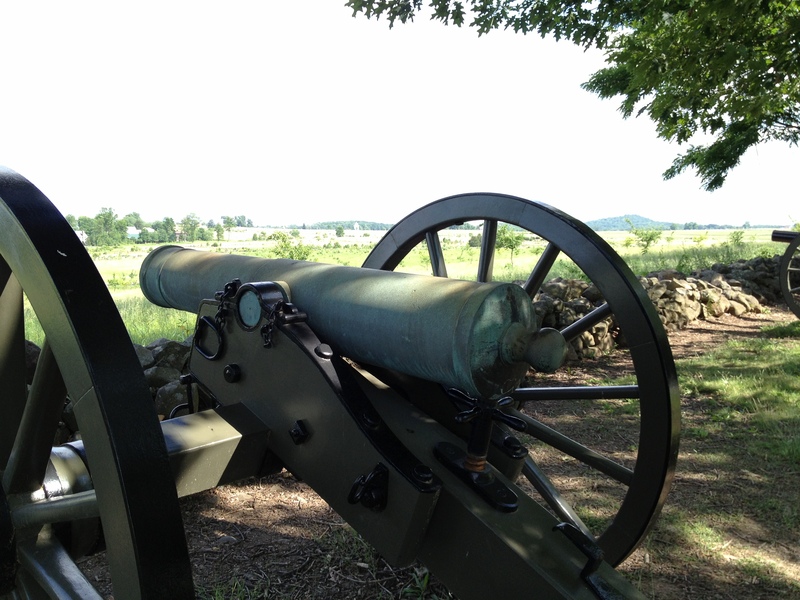 Overview: Not terribly popular for field use (there were only 33 of all types present at the Battle of Gettysburg), these weapons were designed to lob munitions over fortification walls at a high angle. They have short, very cylindrical barrels. 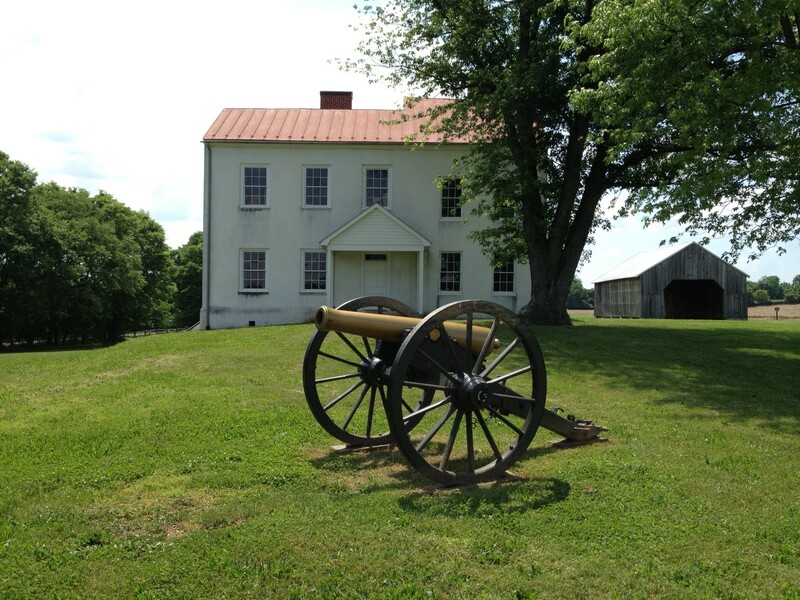 Gettysburg has both the 12-pounder and 24-pounder varieties in their collection. Front View of a Howitzer. Rear View of a Howitzer. How to Identify: The short, cylindrical barrel is your best indication – you just have to learn to eyeball it. As you can best tell from the “front” photo above, there is no taper to the barrel – that’s your best clue. You’ll also note that the howitzer above has an astragal, a slightly thicker reinforce beginning just before the trunnions, and a raised base ring. 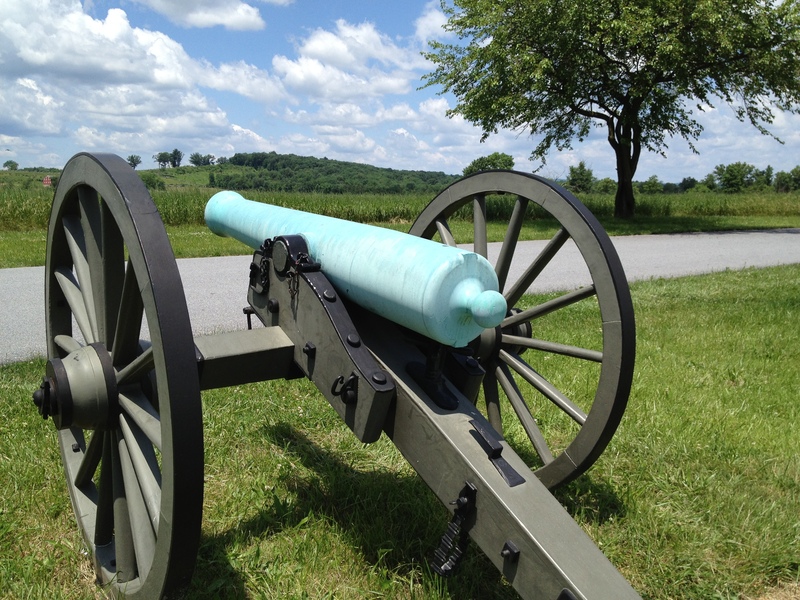 Exceptions: In the collection at Gettysburg, there are 2 Austrian-made 24-pounder Howitzers, currently located near the Mississippi Monument. These are easily identifiable by the large handles on top of the barrel at the trunnions. 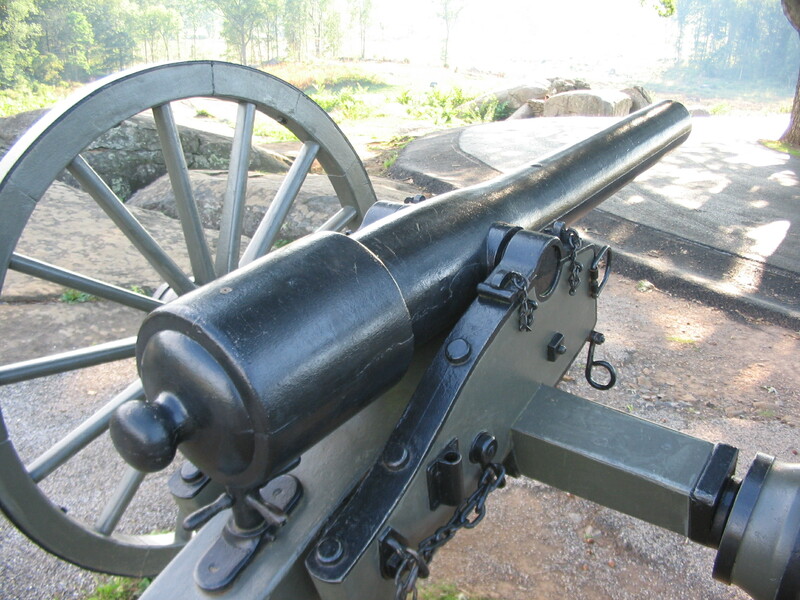 Overview: By the time of the Civil War, the 6-pounder gun was basically a pea-shooter. It was not powerful enough to really be considered serviceable in light of the advancement in weapons like the Model 1857 “Napoleon” 12-pounder, or the newer iron rifled guns. The Confederacy couldn’t always be so choosy though, and they had 1 of these guns in service at the Battle of Gettysburg. 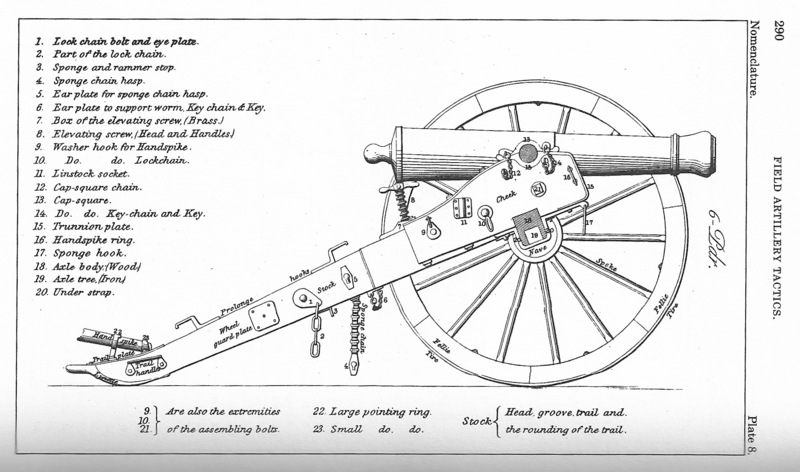 Model 1841 6-pounder Gun diagram. From the 1864 US Army Field Artillery Tactics manual. How to Identify: While physically smaller than the Model 1857 12-pounder Napoleon, they share a similar shape. 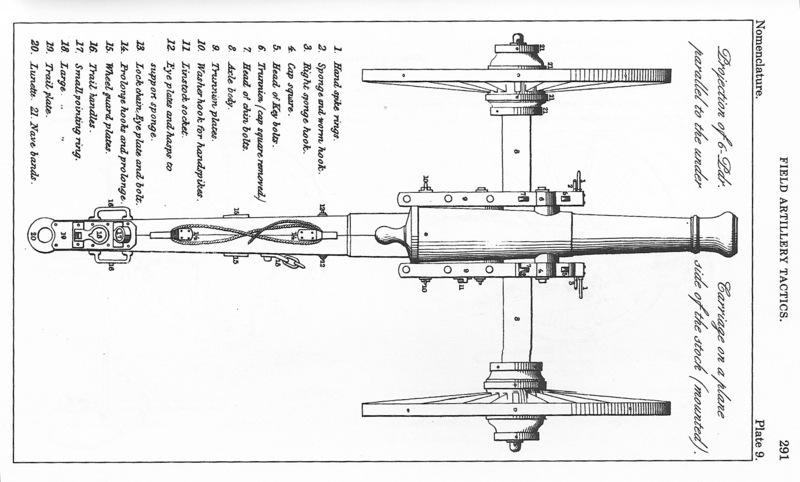 Where the Napoleon is smoothly tapered from breech to muzzle, the Model 1841 6-pounder has a thicker reinforce that drops off sharply to the chase just in front of the trunnions, as you can see above. There is also a raised base ring, and an astragal near the muzzle. These elements give the guns a “fancier” look than the Model 1857. 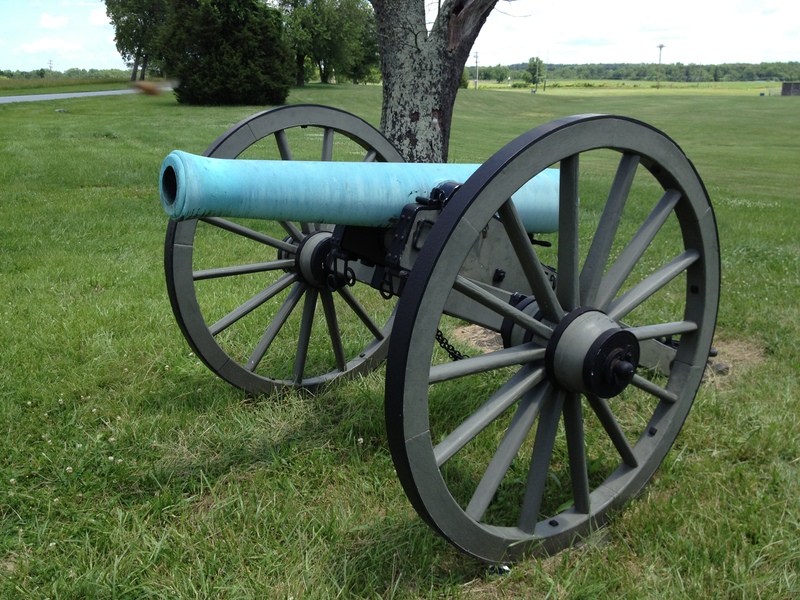 Exceptions: There are 16 of the Model 1841 6-pounders on display at Gettysburg, but only 1 that is still in original condition. It is located along South Condeferate Ave., across from the Texas Monument. The other 15 have been converted to the “False Napoleon” design that I talked about above for battlefield display purposes. Fakes: Since these weren’t in heavy use during the Civil War and there is plenty of supply, there’s been no need for fakes. Overview: Another rare weapon (there were only 4 at the Battle of Gettysburg), the James was a relatively unsuccessful rifled bronze gun patterned on the 3-inch Ordnance Rifle design. 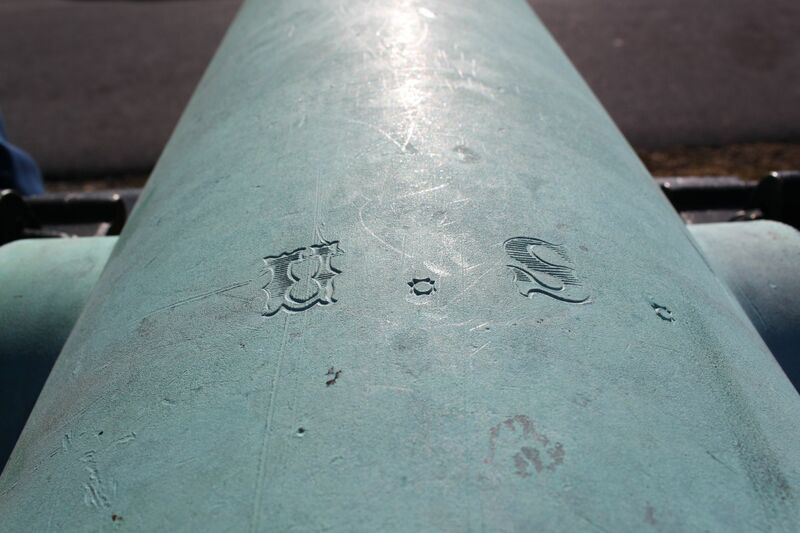 Since bronze is a soft metal, it had a tough time holding rifling – repeated firings would wear the grooves down. Unlike the experimental rifled Napoleons, these guns were designed from the outset to be rifled. 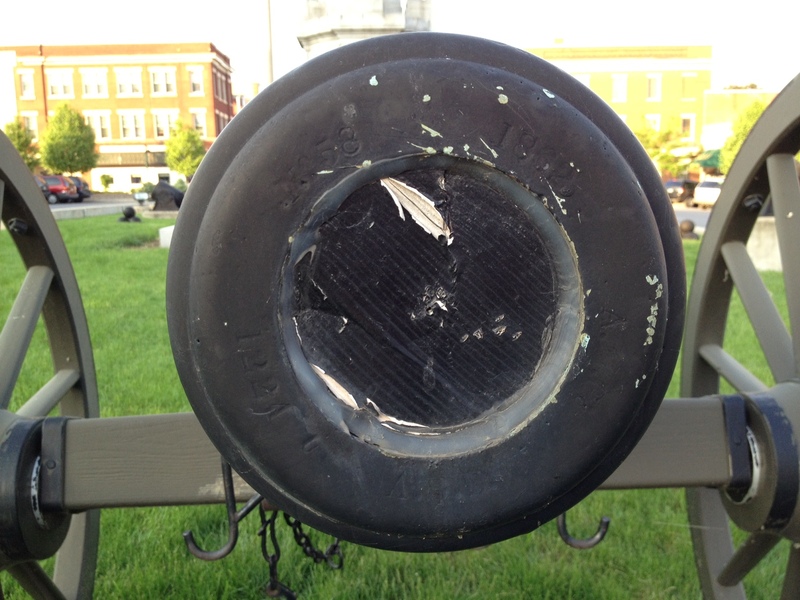 They fired a slightly heavier 14-pound round. Front View of a James Rifle. Rear View of a James Rifle. The Breech and Cascable Knob on a James Rifle. How to Identify: As I explained above, this weapon is a bronze copy of the 3-inch Ordnance Rifle pattern, so it looks like a green 3-inch Rifle in its shape. It has a nice smooth taper down to the muzzle, and that fin-shaped front sight that the rifled Napoleons have. The 2 that are on the field at Gettysburg are along Hancock Ave., south of the Pennsylvania Monument. Exceptions: As far as I know, there aren’t any variations on the James pattern, although there was a Confederate copy of this design. 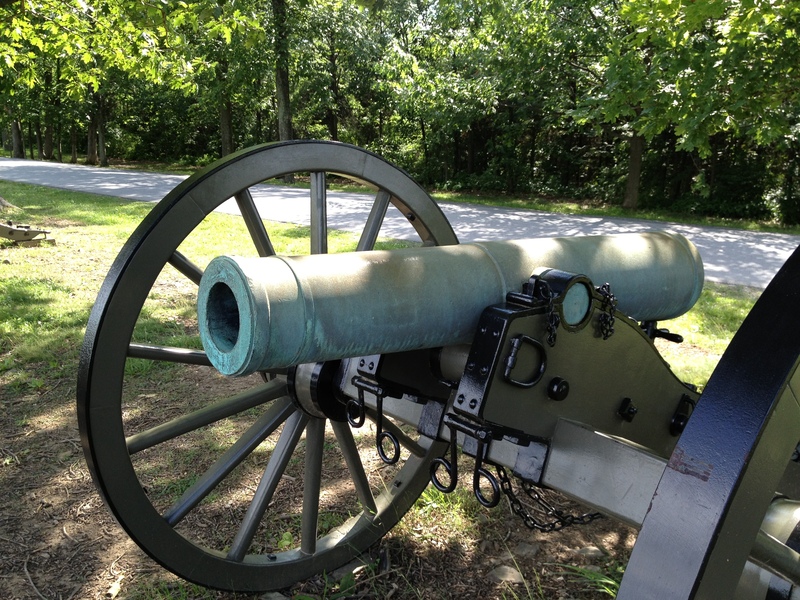 In the next installment, we’ll look at some of the iron weapons on display at Gettysburg, and how to tell them apart. Before we get into more details about the weapons themselves, let’s look at the types of rounds they would have fired, and what they’d have been used for. Understanding these is critical to interpreting official reports from the battles, and getting a sense for what soldiers in the Civil War faced when they were in combat. 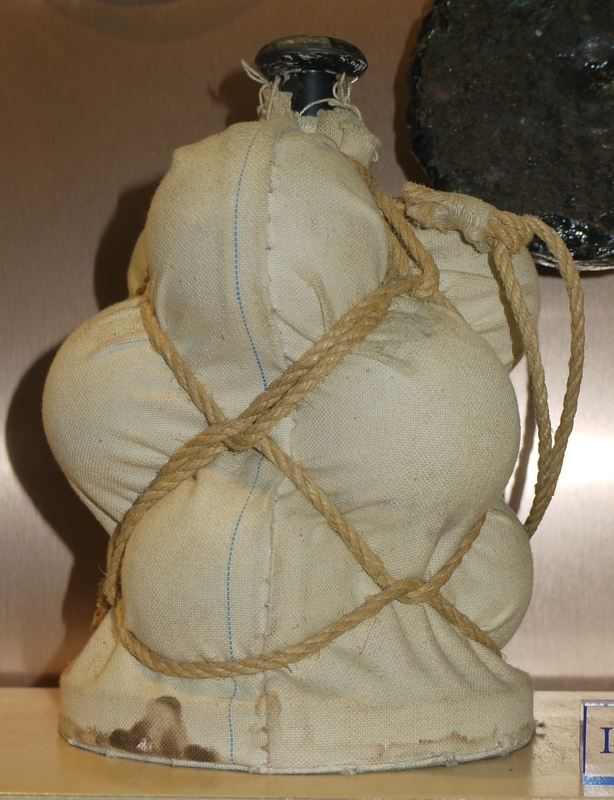 A type of long-range ammunition, this is what people commonly think of as a “cannon ball”. In a smoothbore weapon, this type would be round, and probably called a “ball”; while in a rifled weapon, it would be more conical or “bullet”-shaped, and would normally be referred to as a “bolt”. 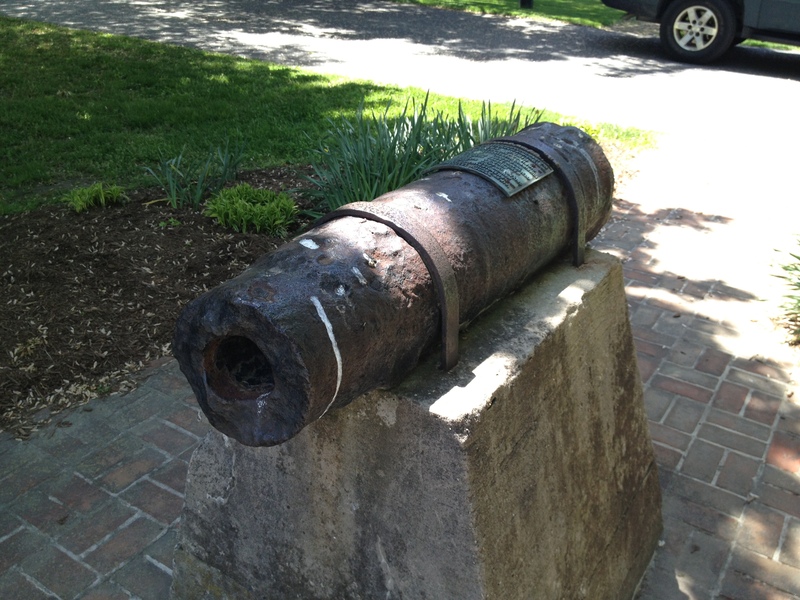 As the name implies, this is a solid hunk of metal (usually iron) that is fired out of the cannon. It was used primarily against buildings or soft fortifications, but could also be fired into trees, turning them into deadly flying splinters, or heavy falling logs for anti-personnel purposes. Fired at a low angle against lines of troops in open fields, solid-shot would tend to bounce through the waves of men, taking them out 2 or 3 at a time as it did. This had more of a psychological impact than a physically-destructive one. In some cases (like during J.E.B. 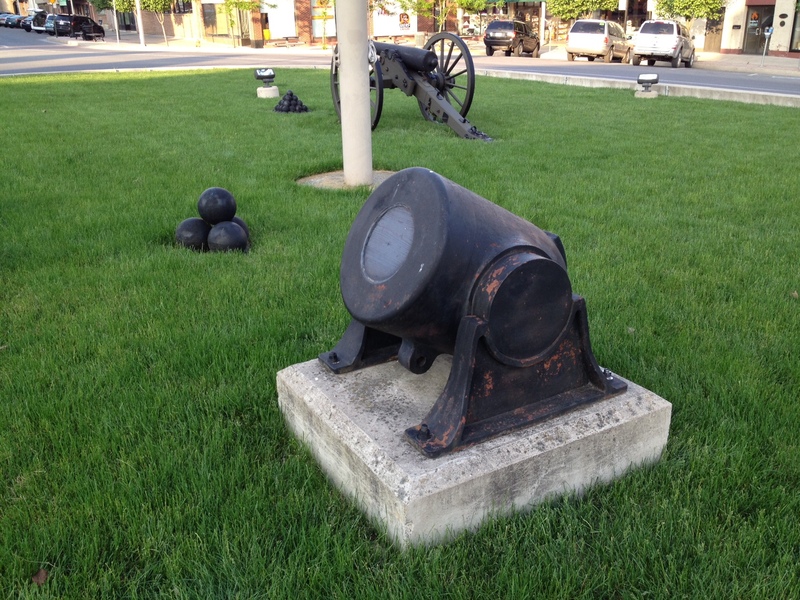 Stuart’s bombardment of Carlisle) these rounds would be placed in a fire or furnace right before being loaded into a cannon so that they would become red hot. In this way, when fired against wooden buildings, the structures would likely catch on fire. 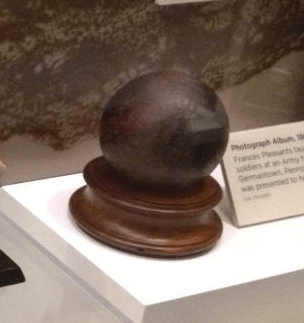 Another long-range munition, the shell is just that – a hollowed-out ball (for a smoothbore) or “bullet” (for a rifled gun) that contains some form of explosive (in the Civil War, that was gunpowder). The idea was to create a flying bomb that would detonate and spray shrapnel and fire in all directions. This was especially deadly against enemy artillery and munitions. There were two mechanisms used to detonate the rounds: the newly-invented percussion fuse, or a more traditional timing fuse. These were screwed into the shell at the time of firing, so the cannoneer could select how his fire was going to behave each time. The percussion fuse was designed to explode on impact. The jolt of the gun being fired armed the round, and then as soon as it struck something – the ground, a building, a tree – it would detonate. Since this was a relatively new technology, and the south didn’t have very good manufacturing facilities, their percussion fuses had a very high failure rate. Many Confederate rounds equipped with this type of fuse failed to detonate. The timing fuse was used much more commonly. This consisted of a selectable paper fuse that would be ignited by the blast of firing the weapon, and explode after a few seconds. The idea was to time it so the ordnance would explode over top of other cannons, ammunition wagons, or troops so that the shrapnel would rain down on them. Very similar to shell, this is a hollowed-out round that contained not only gunpowder, but small iron or lead balls, too. This was shell’s anti-personnel cousin. All the same information about fuse types and their purposes that I talked about for shell also applies to case-shot. This type of munition was very commonly used (and with great effect) during the Civil War, and you’ll see it mentioned in official battle reports from both artillery and infantry commanders frequently. In some of those reports (especially when referencing rounds from smoothbore weapons) this round may be referred to as “spherical case“. 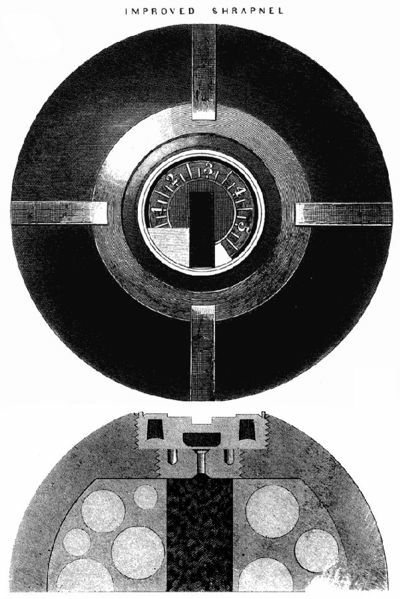 When used with timed fuses, the round could be configured (by cutting the paper fuse extremely short) so that it exploded just before it left the barrel. This method could be used in place of canister in a last resort, low-ammunition situation. Because of the dangers associated with knowingly setting off an explosion that could very easily end up just a few feet in front of your own men, this was not the preferred use. This was the really nasty, short-range, anti-personnel stuff. Basically, it’s a large tin can (like an over-sized soup can) filled with saw dust and dozens of lead or iron balls. When fired, the can would shred immediately, creating additional shrapnel. Canister rounds effectively made a cannon into a giant shotgun. As you can well imagine, this was brutally deadly against the types of line-of-battle formations that were used during the Civil War. 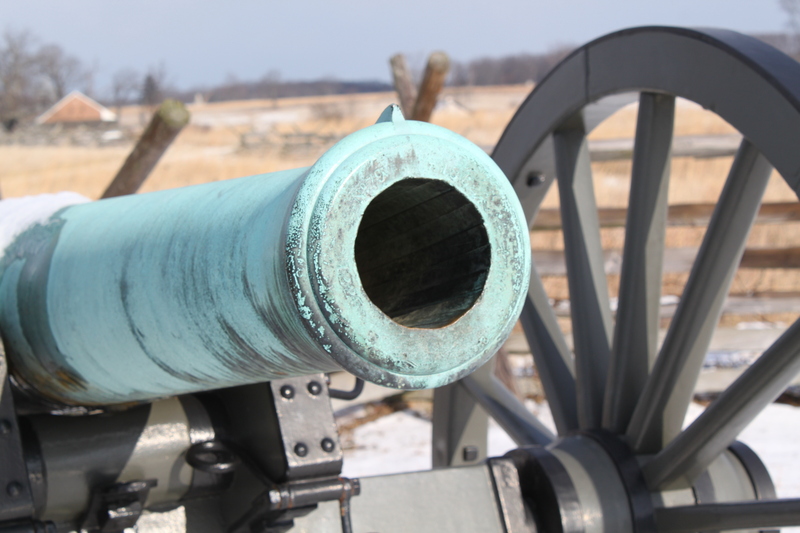 It certainly gives you an appreciation for what the men in Pickett’s Charge must have been thinking, knowing that they were walking into this type of ordnance. Less commonly-used by the time of the Civil War, this was the precursor to the more effective anti-personnel rounds (like case-shot and canister) that came later. In battle reports, this type may simply be referred to as “grape” – a name that comes from its visual similarity to a bunch of grapes hanging on a vine. 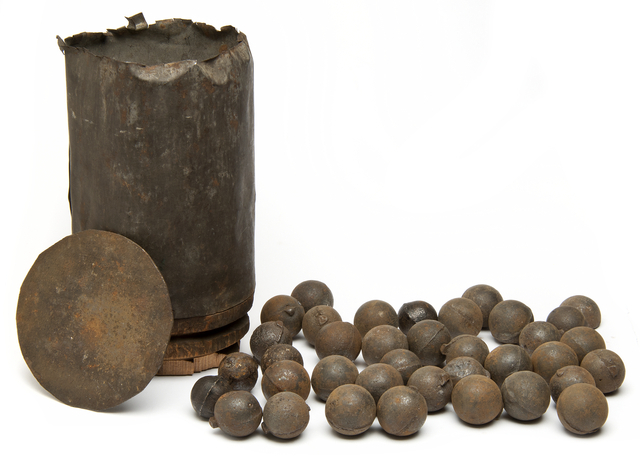 There were several variations of this type of munition, but generally the round consisted of medium-sized iron balls, arranged on plates with a rod holding them together. The whole thing was then placed in a canvas sack. When fired, the round would split apart with the bottom plate pressing forward, sending the balls spreading out through the air toward the enemy. You can see how the less-bulky and awkward case-shots and canisters would be much better than the heavy, overly-complicated grape-shot. Once troops began using trenches and other breastworks that couldn’t be effectively hit from straight on, case-shot (which could be exploded from above and had a much longer range) became the favored anti-personnel round. So that’s the general overview of Civil War ordnance types. We’ll start examining how to identify the different models of field pieces used during the war in the next installment of the series. Earlier this week, a friend sent me a photo that she took at Monocacy. She knows that I’m interested in Civil War battlefields, and that I have a collection of photos that my friends and I have taken over the years on my work computer that I use when my screen is locked. 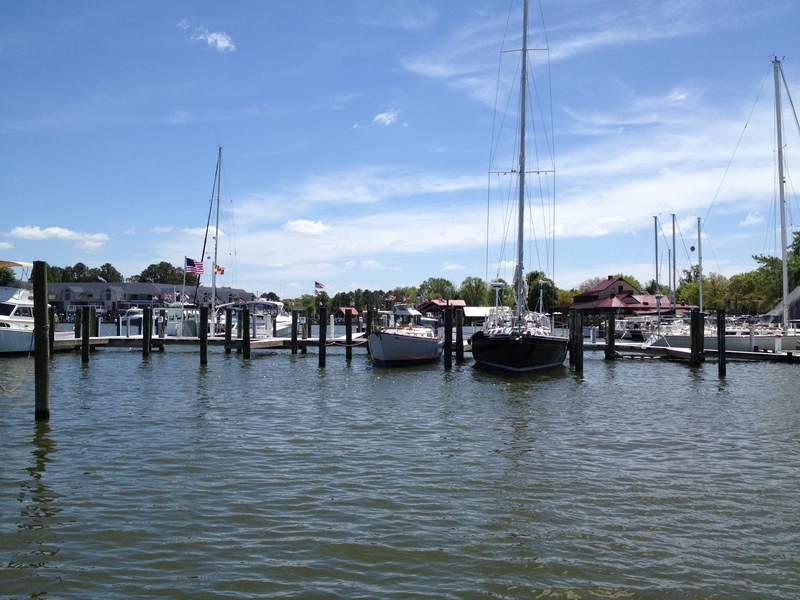 It got me thinking though – I’ve never been to Monocacy. I go to Gettysburg constantly. 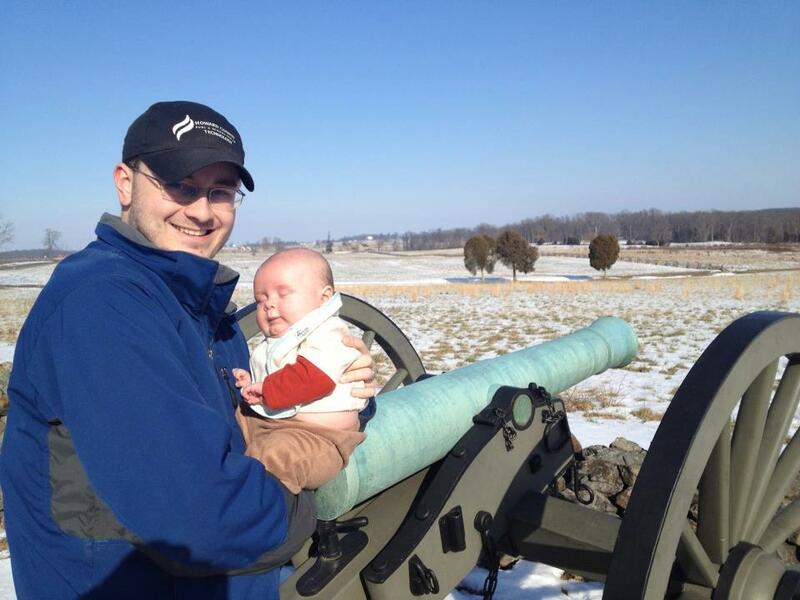 I’ve been to Antietam and Manassas a few times. 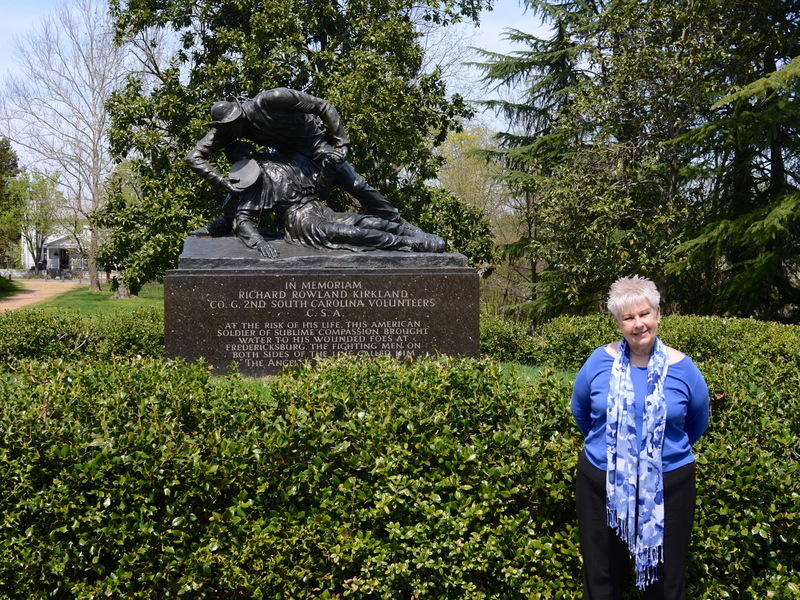 I’ve even started to branch out to the Fredericksburg / Spotsylvania battlefields. But I’ve never been to Monocacy, and it’s closer to my house than any of those other fields. Since my wife was working this weekend, and I’d have to watch John anyway, I figured that we might as well have an adventure. I wanted to do my homework first. I went looking for information about the battle in my “new” Time-Life Civil War books. Strategically, I thought the Battle of Monocacy was part of the Overland Campaign, but there was no mention of Monocacy in the book that covers it. No mention in the book about the Petersburg siege either. It wasn’t until I checked the book about the Shenandoah Valley that I found info. 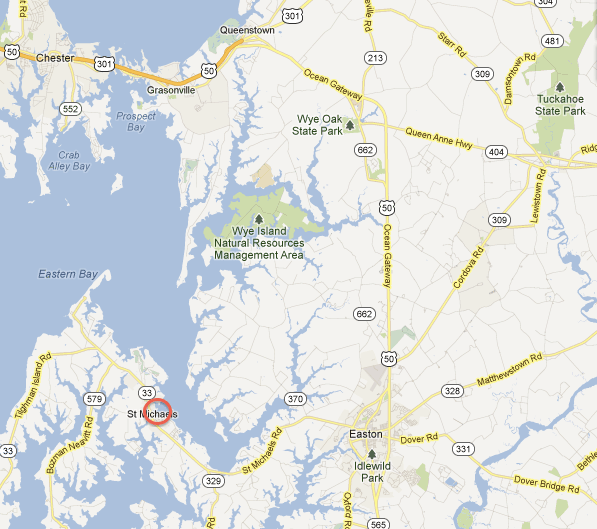 While Early did travel to Maryland via the valley, I don’t think I’d consider his move a part of those campaigns. Regardless, there was a decent overview of the action, and it gave enough context that I wouldn’t be lost when I got to the field. The basics are these: The Confederate Army of Northern Virginia has been bottled up in the defenses of Petersburg, VA following Grant’s horribly bloody Overland Campaign. In an attempt to relieve some of the pressure of the siege, Lee sends Lt. Gen. Jubal Early with 15,000 men, north to threaten Washington, DC. Since the capital’s defenses had been more-or-less cleared-out to strengthen Grant’s army, Early didn’t expect much resistance. Major Gen. Lew Wallace, commanding the Middle Department, called for help from all quarters. He was able to pull together about 6,600 troops from militia units, emergency volunteers, and even the Washington defenses, and set out toward Frederick hoping to meet the advancing Confederates. Wallace knew he didn’t have much of a chance to defeat Early’s overwhelming number of battle-hardened troops, but he hoped to do exactly what he ended up doing – delay Early’s advance long enough for the reinforcements that Grant was sending to arrive in the capital. 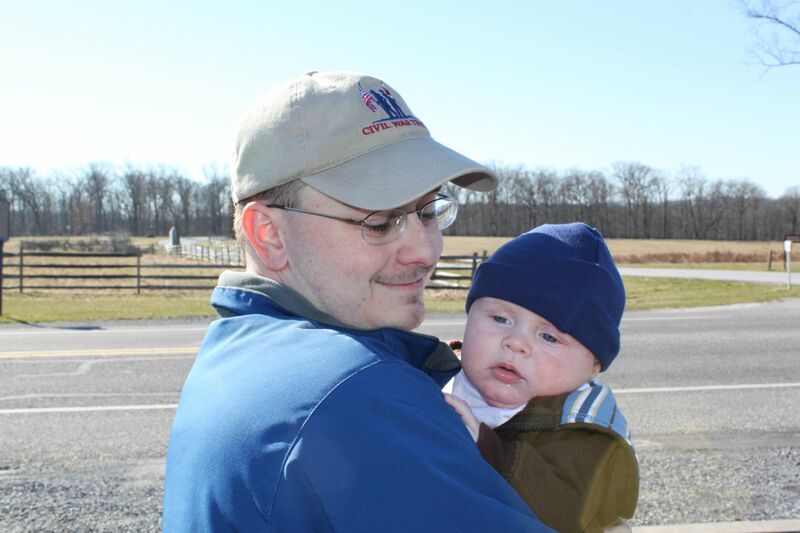 Armed with my basic understanding, I packed John up this morning and got on the road west to Frederick after lunch. It took less than 45 minutes to get to the visitor center. Revere Napoleon#46 in front of the visitor center. shows this weapon as being held by the Antietam National Battlefield a few miles down the road, so this piece must have been recently transferred. That happens from time to time. 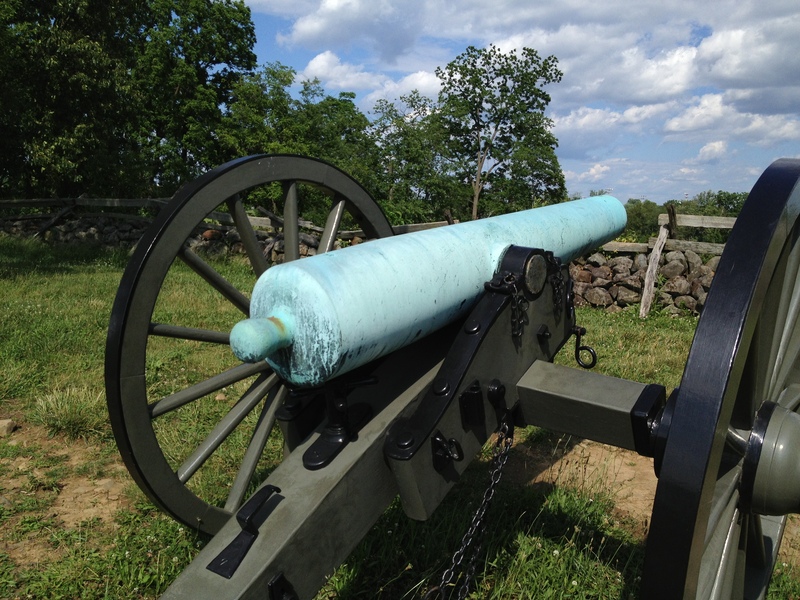 According to the Register of Inspections, this gun was accepted into service on May 20, 1862, so not only would it have been on the field in time for Gettysburg, but for Antietam, too – which is probably why they were the owners of the piece at one time. 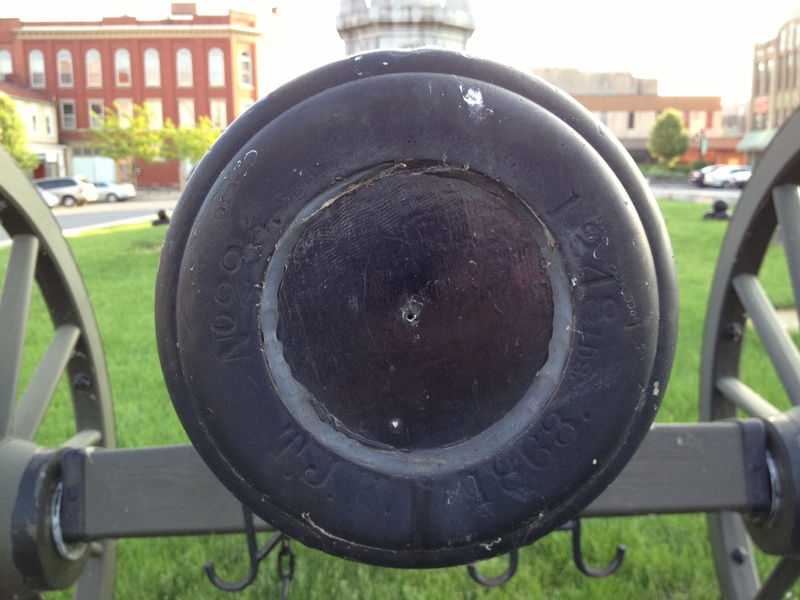 Like the other Reveres, it has the ornate “U.S.” acceptance mark on the top of the barrel between the trunnions. This was fun (and unexpected) to see. 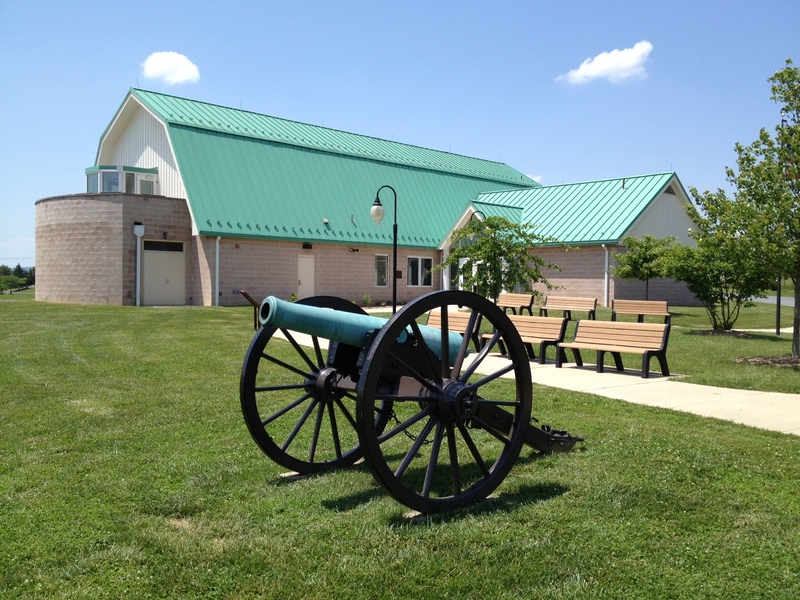 The visitor center is on the small side – it’s comparable in size to Chancellorsville’s. There’s an information desk and gift shop on the main floor, and museum exhibits upstairs. There’s more flashy interactive stuff there than actual artifacts, but it’s very well put-together. The whole building seems very new, although I’m not really sure when it was built. I got my park map, and started out on the auto tour. One of the other nice things that the park management has put together is a downloadable audio component to complement the tour – it’s also sold as a CD in the visitor center for less than $3. Having that audio really made for a nice experience. Each of the 5 tour stops has about a 5 minute clip associated with it. Combined with well-produced wayside markers at each stop, and the fact that the battle only lasted for 1 day and didn’t have too many moving pieces, you can easily get a good understanding of what happened here back in 1864. “Napoleon” at the Best Farm. From a distance, I saw a bronze-colored Napoleon. I’ve never seen this on a battlefield before (outside of a gun brought by re-enactors). This is what the guns would have actually looked like during the war – the familiar greenish patina on the bronze weapons is what happens to copper when it “rusts”. Was this an extremely well-kept Napoleon? Sadly, no. 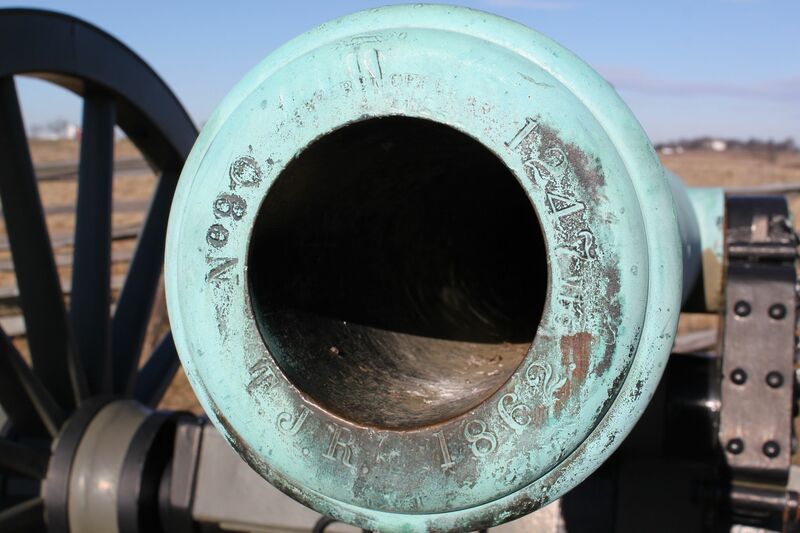 On closer inspection, it was obvious that this was an iron weapon that had been painted a bronze color – there were areas on the gun where the paint had chipped and you could see black (or even rust) underneath. There are no markings on the trunnions, rimbases, or muzzle. These are clearly reproduction guns meant only for display. While that’s disappointing, it’s nice to see a gun presented to the public on a battlefield, looking the way it would have looked at the battle. I’m a little torn on this. I saw one other reproduction gun like this one on the Worthington Farm (stop 3 on the tour), and no other weapons anywhere on the field. That’s a pretty accurate portrayal of the artillery at this battle so far as I can tell. 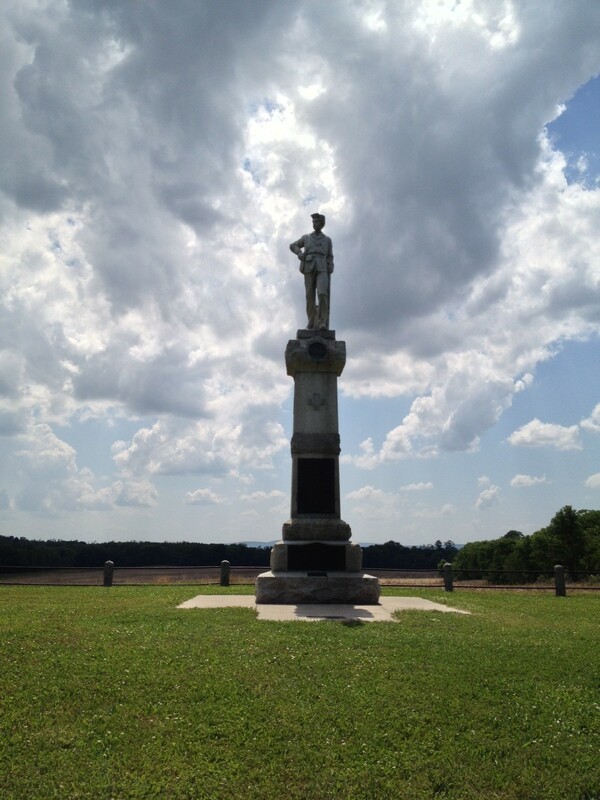 Monument to 14th NJ near Monocacy Junction. It’s a similar situation for monuments. 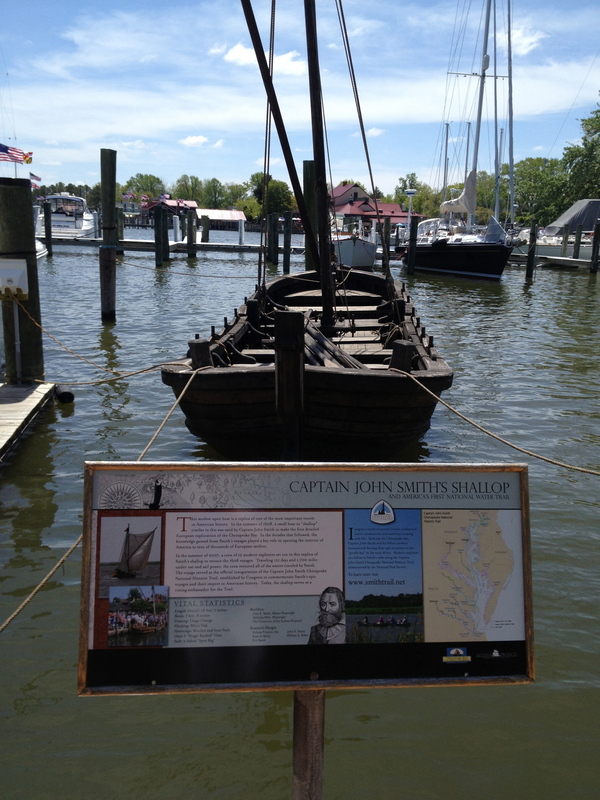 While explanatory waysides were plentiful, I counted only 5 commemorative monuments. 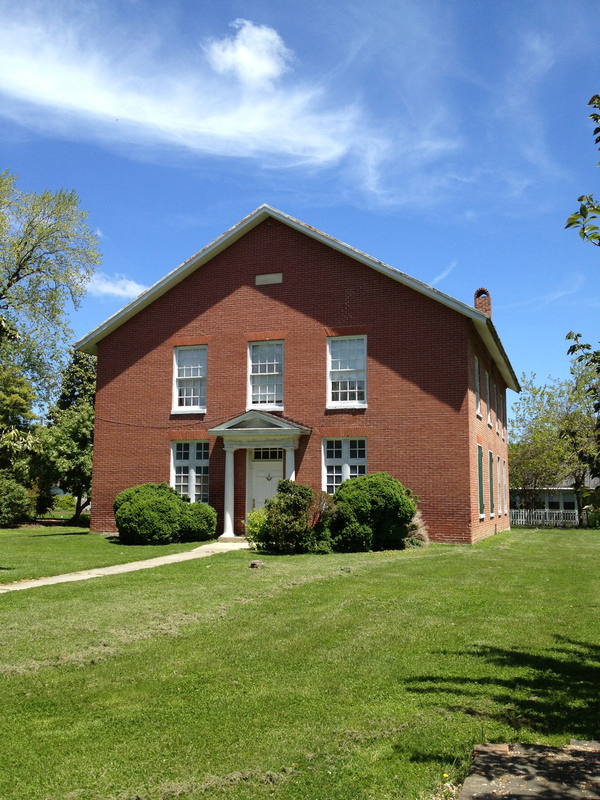 One of these – and certainly the grandest one – was a monument to the 14th New Jersey Infantry, which became known as the “Monocacy Regiment” because it had served in this area early in the war defending the railroads, and then returned after a stint with Grant in the Overland Campaign to defend it once again. While I haven’t established a full service history for him yet, I’ve known that a distant cousin, John B. Skillman, served with the 14th NJ at some point during the war. 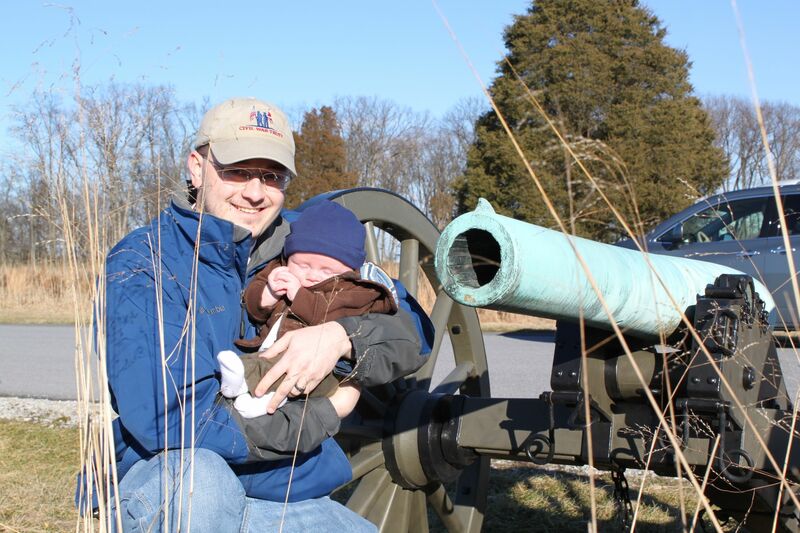 Since it would be a family connection to this battle, and since my infant son is named John, too, this may be one of those things that I need to research further. Other monuments include one placed by the United Daughters of the Confederacy next to a more descriptive one placed by the State of Maryland. There are also two other unit monuments: one remembering the 87th Pennsylvania, and another across the road for the 10th Vermont. None of these is easy to visit because of parking challenges, though. There are a few walking trails on the property, and from what I can tell on the maps and from looking at the ground in person, they look like they’d be nice. Several of them go right down to the Monocacy river. The scenery is peaceful, and there’s plenty of interesting old farm buildings, too. It was oppressively hot today, and I didn’t have a good way of carrying John with me, so I didn’t attempt to walk them myself. All-in-all, I’m glad I went to see the field. To my mind, it’s a relatively minor and simplistic engagement tactically, but it does end up buying time to bolster the defenses of Washington, DC – stifling any chance that the Confederates had of creating serious political problems for Lincoln right before the 1864 election. In this light, it is strategically important to the war, and a strategic Union victory. It’s worth taking a couple hours to pay tribute to the men who fought here and learn a little about this part of our history.